We pride ourselves on a wide range of quality headphones for schools. It can be a tricky task to source quality, good value and durable headphones but we will ensure you are only provided with the very best with our extensive tests in place to ensure you get the quality that you deserve. Bulk Buy Discounts. FREE Samples available. We know that school headphones need to be durable, comfortable and safe, so we're always looking for headphones which match this criteria. Recently we've added the Califone Junior Headphones to our range. It's not easy to find headphones for kids or young children specifically, but these headphones have been designed especially for young children. Their lightness and small size means they fit comfortably on children's heads, and they feature noise-cancelling leatherette padded ear cushions so even in the loudest environments the volume will not need to be at a potentially unsafe level. 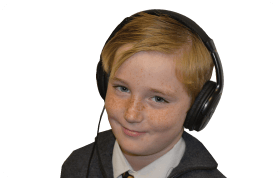 See above for our full range of school headphones and classroom headphones for kids. If you have any questions about headphones range, please feel free to contact us (tel: 08000 80 77 80 or sales@wishtrac.com) and we'll be happy to help.